What if you could tour America’s largest coffee farm? Or visit the wettest place on Earth? Or discover the tight-knit village that inspired the setting of Disney’s Lilo and Stitch? 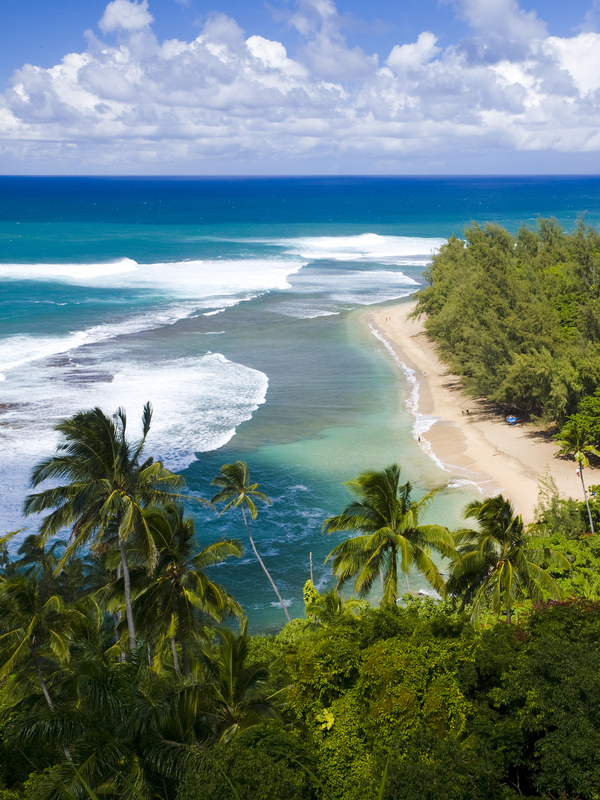 Spend your next vacation on Kauai, and you can! 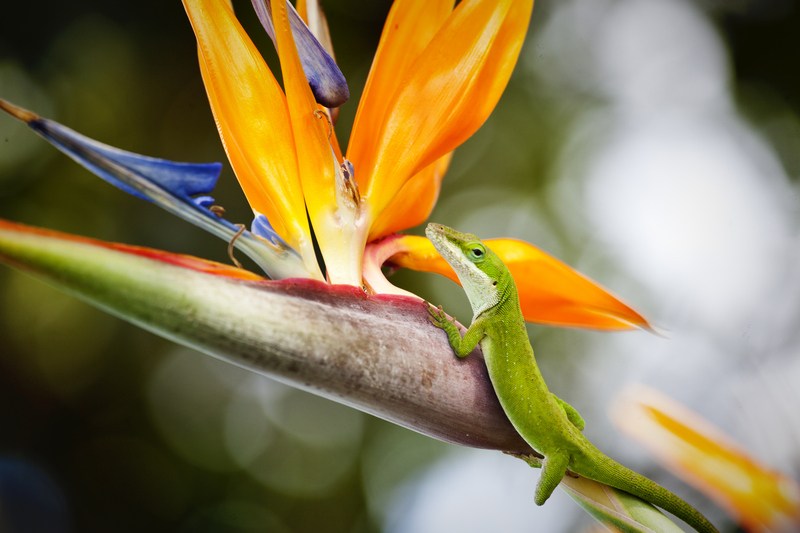 No matter what you see and do on Kauai, you’re bound to get hungry eventually. Not to worry: Kauai has you covered. Dining options range from high-end restaurants like Red Salt (with sushi that’s often called the best in the world) to casual cuisine at Hukilau Lanai (where all ingredients are sourced from local farmers and fishermen). Don’t take my word for it, though. Check out this awesome infographic, brought to you by Fern Grotto Inn, for more mind-blowing Kauai facts and tips from a local’s perspective! And hey, why stop there? Use the handy embed code beneath the infographic to easily share with your friends and family! Mele Kalikimaka! Celebrate Christmas in Kauai. 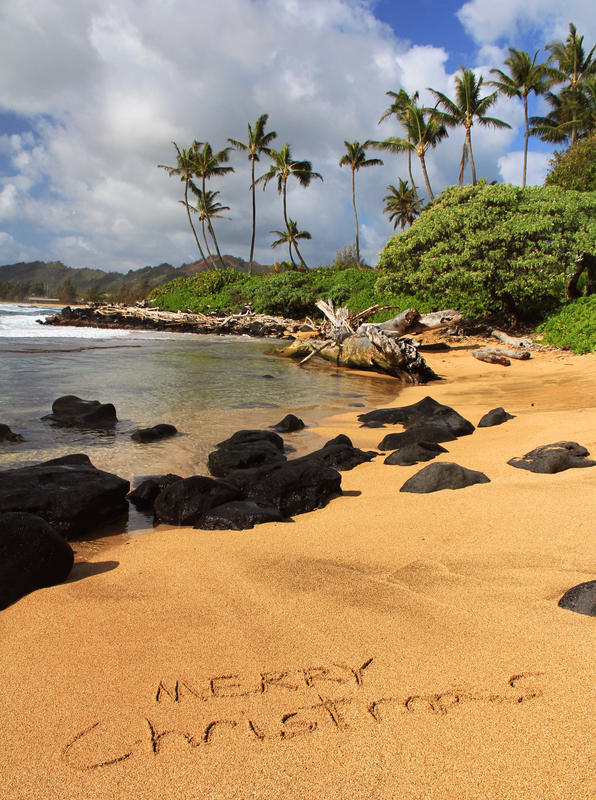 Make this Christmas one to remember by staying at our Kauai vacation rentals. Our lush, green gardens are a far cry from the traditional White Christmas, but with temperatures that average 67 to 79 degrees, we think it’s a fair trade-off. 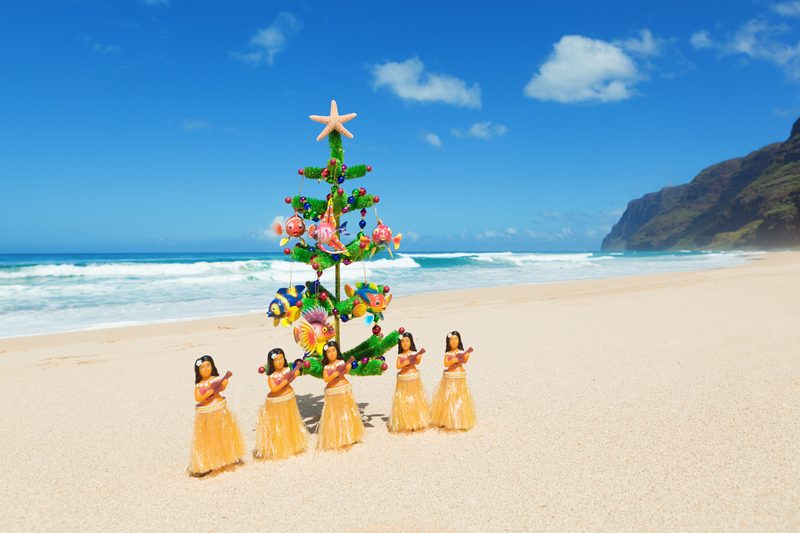 Here are some of our suggestions on how to avoid the chill and celebrate Christmas Kauai-style. 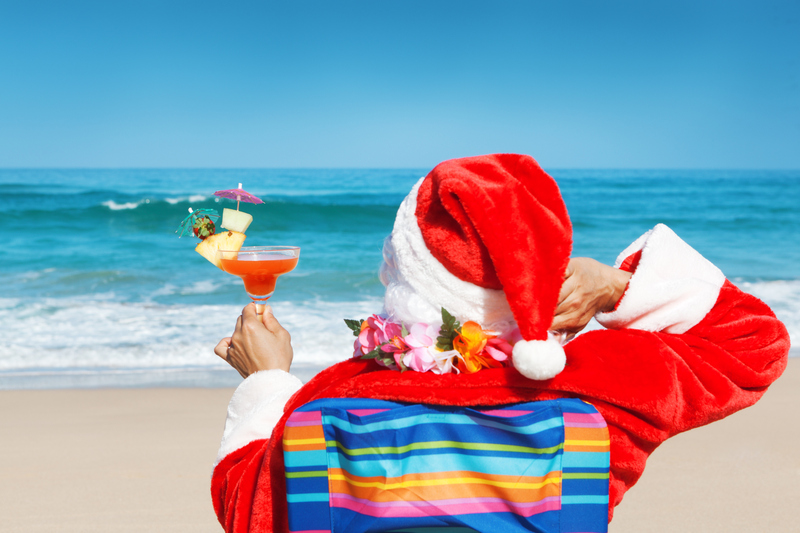 Celebrate a Mele Kalikimaka by relaxing with your nearest and dearest at our Kauai cottages. Instead of building snowmen this year, take the short walk down to the beach and build sand castles (you may even see Santa paddling by in an outrigger canoe). From musical and hula concerts to art shows and craft fairs, there are plenty of holiday events happening throughout Kauai. 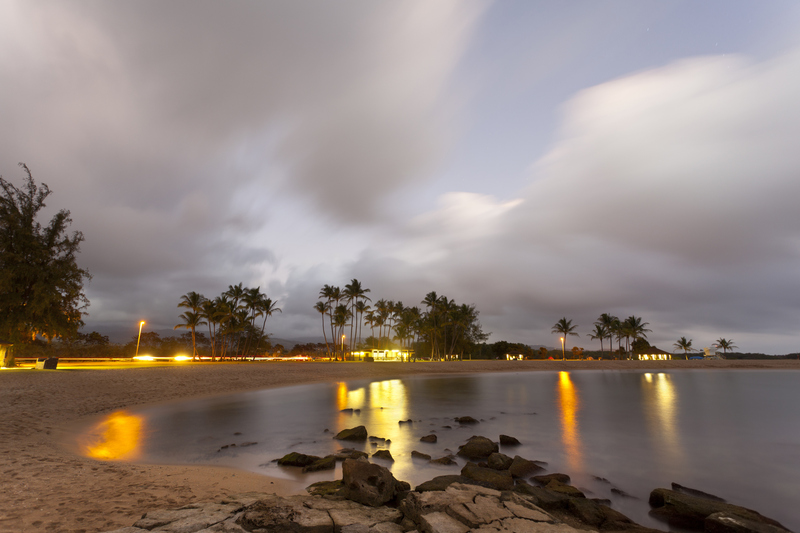 Walk or bike through the Kapaa area and see the local homes and shopping areas decked out in glittering lights. Drive 6 miles from Fern Grotto Inn to Lihue to view the annual Festival of Lights at the historic county building. Lights in the park glow from the first week of December until New Years Day, and inside the building you’ll find stunning holiday displays. 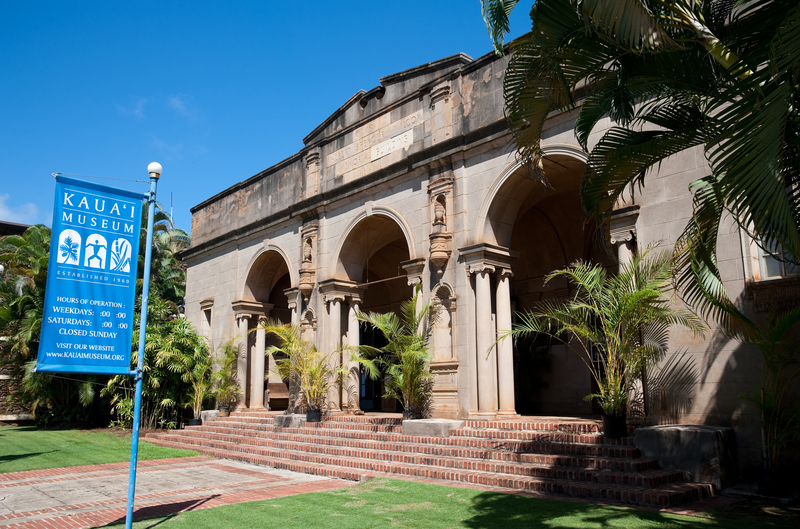 While you’re in Lihue, visit the Kauai Museum, which holds its annual Christmas Craft Fair in December. Visitors can purchase authentic Hawaiian-made gifts, participate in craft lessons and view wreath displays. The town of Waimea glitters with light displays throughout December, but the best time to head there is for the Waimea Lighted Christmas Parade on December 21st. As the sun sets the parade begins with spectacular, lighted floats, horseback riders, dancers and Santa Claus. Following the parade there is entertainment, carols sung in Hawaiian, and plenty of goodies to enjoy. 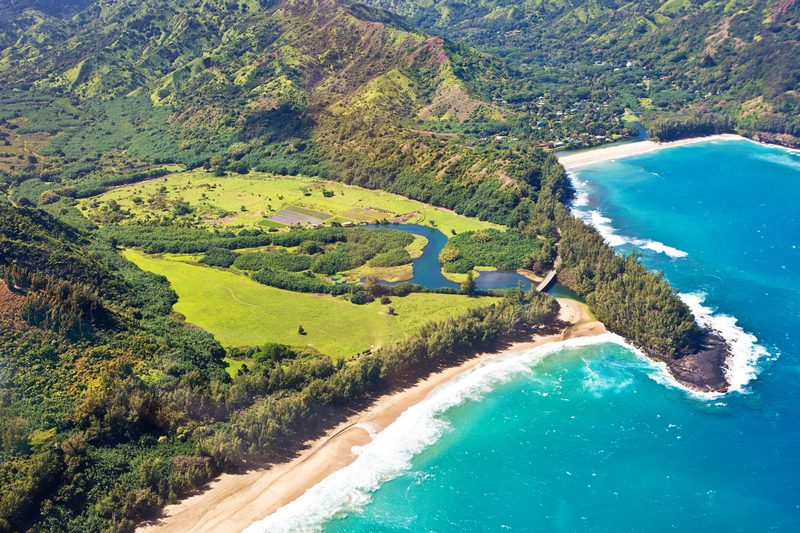 Ready to spend Christmas in Kauai? Tucked on the east side of the island in Kapaa, Fern Grotto Inn offers authentic old-style plantation cottages with island-inspired furnishings and modern amenities. Discover the Kauai vacation rental you’ve been dreaming of, surrounded by a lush landscape of fruit trees and located only a block from the beach. Please contact us to see how we at Fern Grotto Inn can help make your stay on the Isle of Discovery an unforgettable adventure! Kauai Vacation Rentals – The island of Kauai has attracted countless A-list movie directors due to its pristine beaches, dense tropical forests and stunning mountains. Many creative superstars found that the Isle of Discovery wasn’t just an ideal backdrop for their films, but also a perfect place to work and relax. 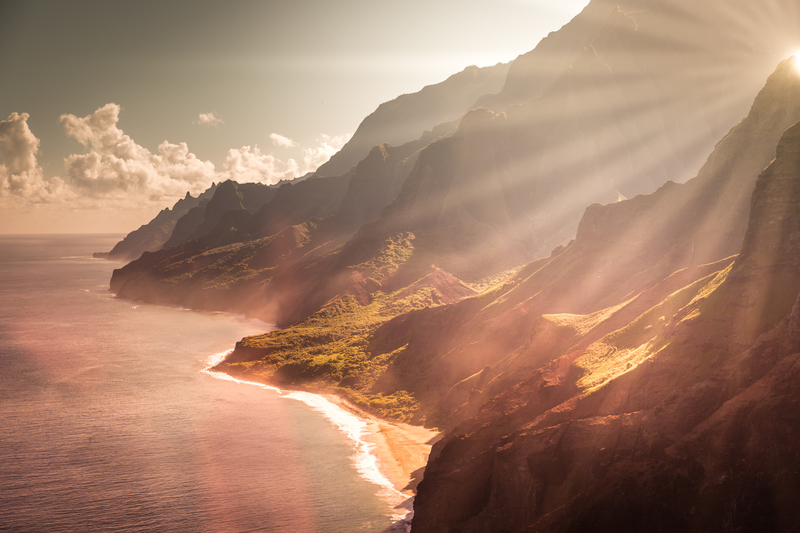 Over 70 years ago, directors and producers starting coming to Kauai because the landscape is diverse enough to accommodate their wildest visions. From Elvis to Clooney, from Blue Hawaii to Jurassic Park, lush tropical forest scenes became completely authentic with Kauai as a backdrop. When a director needs a jungle scene, like in Raiders of the Lost Ark, the Garden Island was a perfect choice. Imagine over 500 acres of stunningly beautiful landscape that creates a completely uninterrupted canvas on which to make a film, with enough diversity to mimic drastically different settings. For Flight of the Intruder, the 1991 film starring Danny Glover, the director found Kauai to be the ideal representation of both the Philippines and Vietnam. Recent years have seen the release of several big budget films that were shot on Kauai. The Descendants, with George Clooney, was filmed here, as well as The Pirates of the Caribbean: On Stranger Tides, featuring Johnny Depp as Jack Sparrow. If you remember the story of Bethany Hamilton, the young girl who lost her arm to a shark in a surfing accident, her story, Soul Surfer, was also filmed on Kauai. It’s true: Hollywood has found our island home to be a great place to make movies, and we can expect to be featured on the silver screen well into the future. 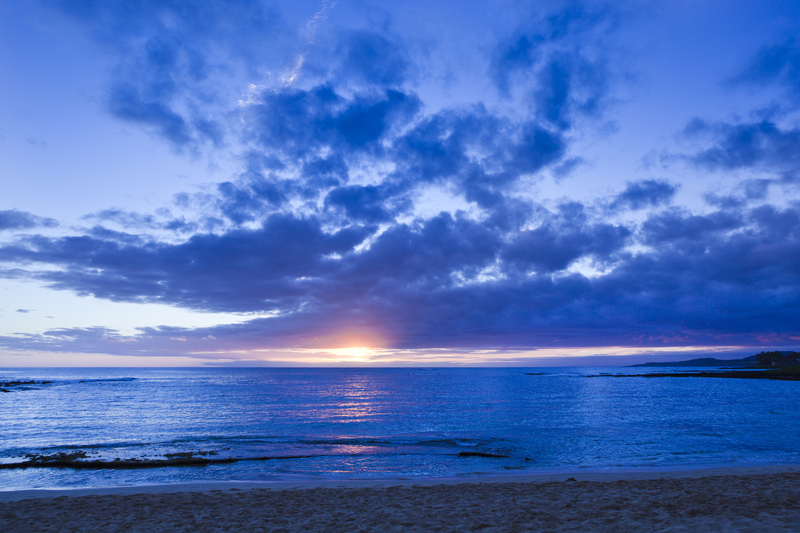 Come explore the island adored by big screen directors by staying at our Kauai vacation rentals. Tucked on the east side of the island in Kapaa, Fern Grotto Inn offers authentic old-style plantation cottages with island-inspired furnishings and modern amenities. Discover the Kauai vacation rentals you’ve been dreaming of, surrounded by a lush landscape of fruit trees and located only a block from the beach. Please contact us to see how we at Fern Grotto Inn can help make your stay on the Isle of Discovery an unforgettable adventure! 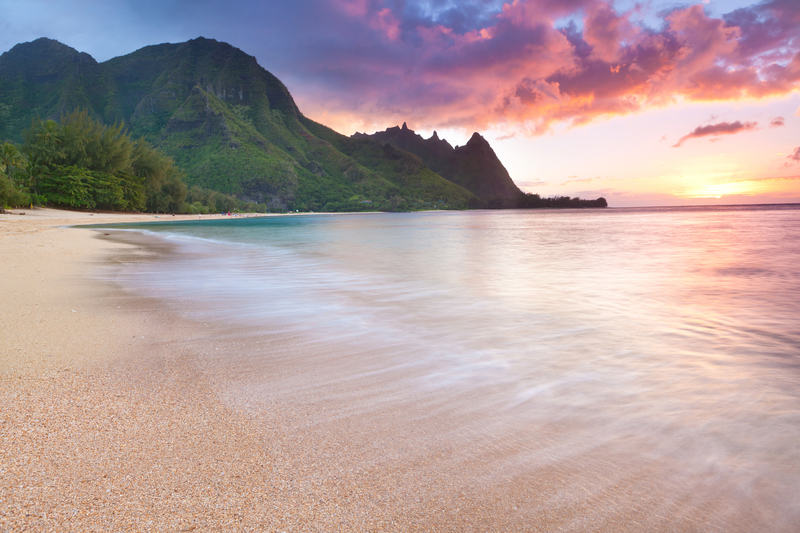 Out of all the Hawaiian Islands, Kauai emerged from the sea first. 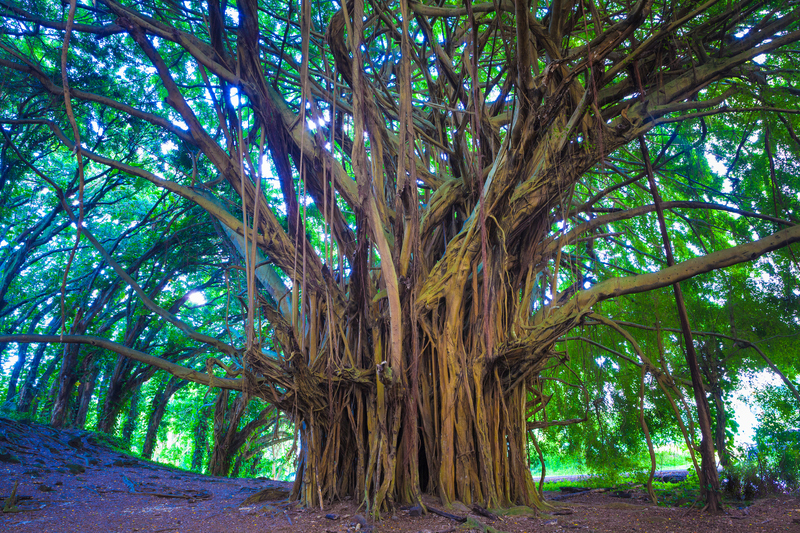 Our ancient island has a rich history full of fascinating facts and interesting folklore, and at Fern Grotto Inn, the premier Vacation Rentals in Kauai, you’re perfectly positioned to explore the island and get a glimpse into what life was like in years gone by. Here are two fascinating historical phases that you can get an up close and personal look at during your stay. Some of the island’s first residents were the Menehune. These master builders were seldom seen, due mostly to their very small size, and have been credited with the creation of the beautiful fishponds and aqueducts on the island. The natives on the island were not too fond of their nocturnal construction so they stayed hidden in the forest, only to venture out when no one was around. 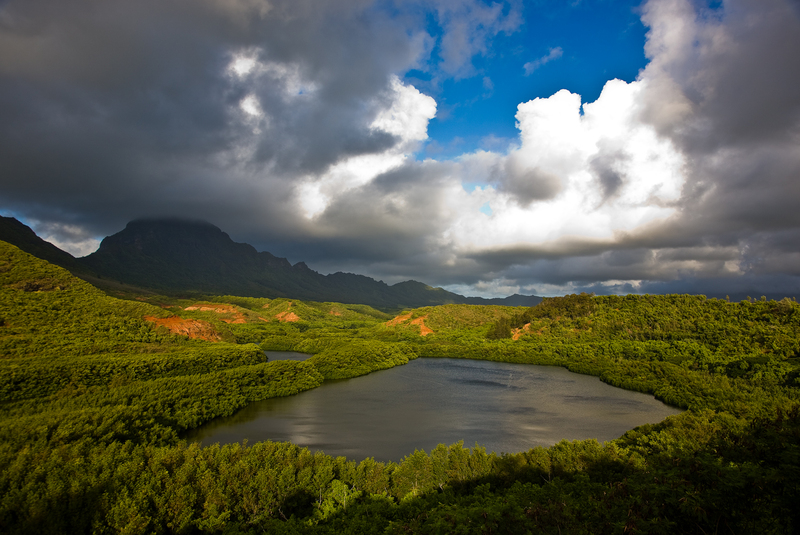 The ancient peoples would tell you that to see some of their work, visit Alekoko, better known as Menehune Fishpond, which is located near Lihue. It was on the island of Kauai, at Waimea Bay, that Captain Cook came ashore. As the discoverer of the islands he named them the Sandwich Islands, in honor of The Earl of Sandwich. The year of his “discovery” was 1778. At the same time, King Kamehameha I was trying to bring all of the islands together under his control. Kauai, and the neighboring island of Niihau, did not want to be included in his “kingdom” so they rebuffed his advances. Eventually, King Kaumualii of Kauai, decided that it would be better to live in harmony, so in the spirit of cooperation (and to avoid further bloodshed), they joined with the other islands under King Kamehameha I. Unfortunately, Captain Cook brought more than goodwill to the islands. The members of the crew carried disease with them as well. Typhoid, measles and the flu would take their toll on the population who had never been exposed. An estimated 80% of the native population succumbed to disease during the following century. Not one to hang around too long, Captain Cook left the islands to continue his explorations. When he returned in 1779, he had a run-in over a fishing boat on the Big Island at the north shore of Kealakekua Bay and was killed. 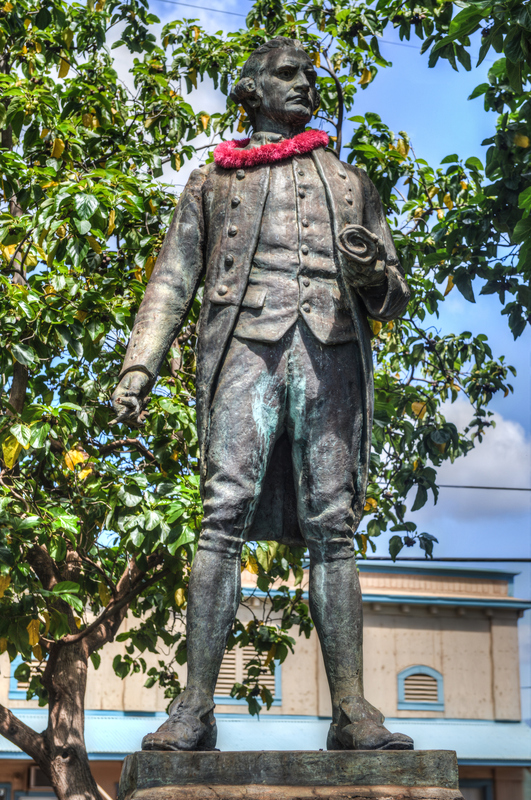 Kauai still has a statue dedicated to Captain Cook, which you can see at Waimea Town. 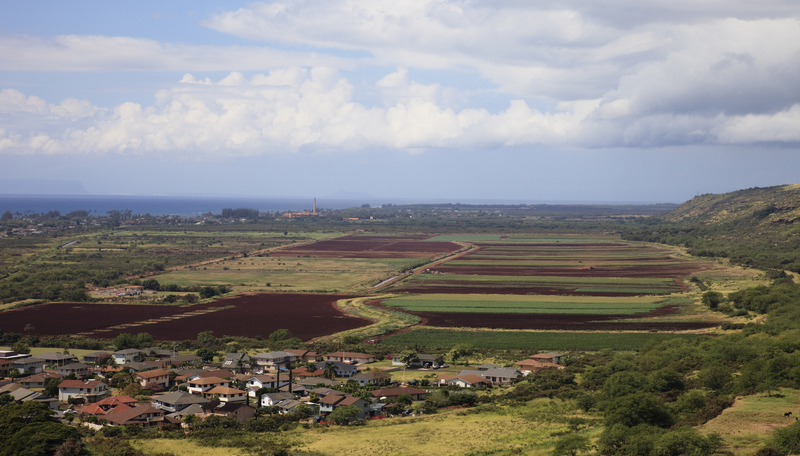 When you stay at our vacation rentals in Kauai, we’ll clue you in about the island’s history and point you in the right direction to uncover it yourself. Tucked on the east side of the island in Kapaa, Fern Grotto Inn offers authentic old-style plantation cottages with island-inspired furnishings and modern amenities. Discover the vacation rentals you’ve been dreaming of, surrounded by a lush landscape of fruit trees and located only a block from the beach. Please contact us to see how we at Fern Grotto Inn can help make your stay on the Isle of Discovery an unforgettable adventure! Named after the Hawaiian word for cliffs, the Na’Pali Coast of Kauai is lined by staggering rock formations. 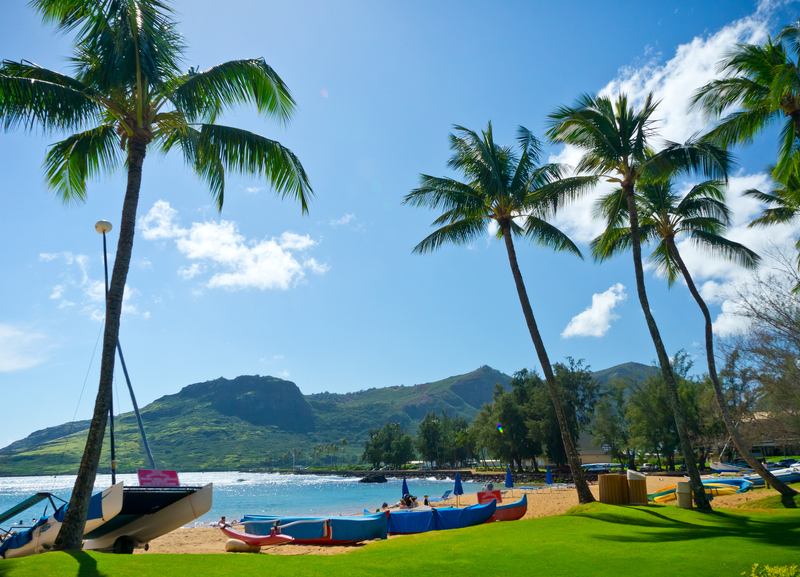 It’s an unforgettable place to go kayaking — a favorite of many of the guests that stay at our Kauai vacation rentals. The Na Pali Coast stretches for approximately 17 miles, and is lined not only by massive cliffs, but also dark caves and pristine beaches. Kayakers can navigate the Kalalau Trail in two separate sections, each of which contains scenic surprises like waterfalls and native plants. A good place to begin is at Haena Beach Park, stopping at Kalalau or Milolii before continuing onward to Polihale State Park. Experienced kayakers may make the entire trip in one day, but beginners are advised to plan two or more days to complete the excursion. Many people prefer a seasoned expert to accompany them when touring part of the route, and guided trips are generally available from May through September each year. In fact, kayaking along this route is only recommended during these months, as unpredictable sea conditions can make kayaking dangerous at other times. During the winter months, the coast can still be accessed via hiking. Contact Josh from Napali Kayak for a guided trip. When kayaking along the Na’Pali Coast, be sure to bring plenty of food and water with you, as you won’t be able to purchase them once you begin. The waves here have been known to cause seasickness, so you should consider bringing motion sickness pills with you as well. The waters along the Na’Pali Coast are extremely clear — so clear you’ll get a glimpse of boulders that have fallen from the cliffs. You could also see a variety of marine life such as reef fish, dolphin and even the endangered sea turtle. After an exhausting day on the waves, come home to Fern Grotto Inn. 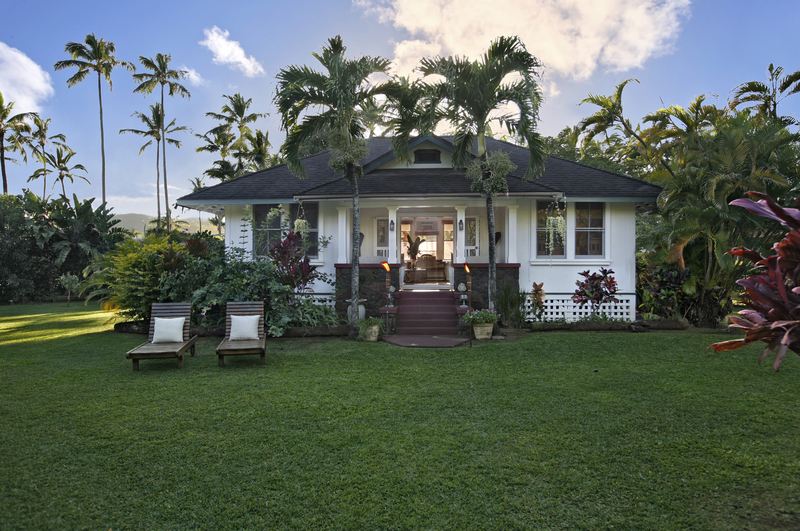 Our plantation-style cottages offer you the chance to experience Kauai the way it was meant to be seen. Wander past fruit trees, stroll to the beach and unwind in private accommodations with modern amenities, full kitchens and comfortable bedrooms and living areas. We’re located on the east side of the island in Kapaa and are close to authentic luaus and breathtaking beauty. Please contact us to learn more about your dream Kauai vacation rental. 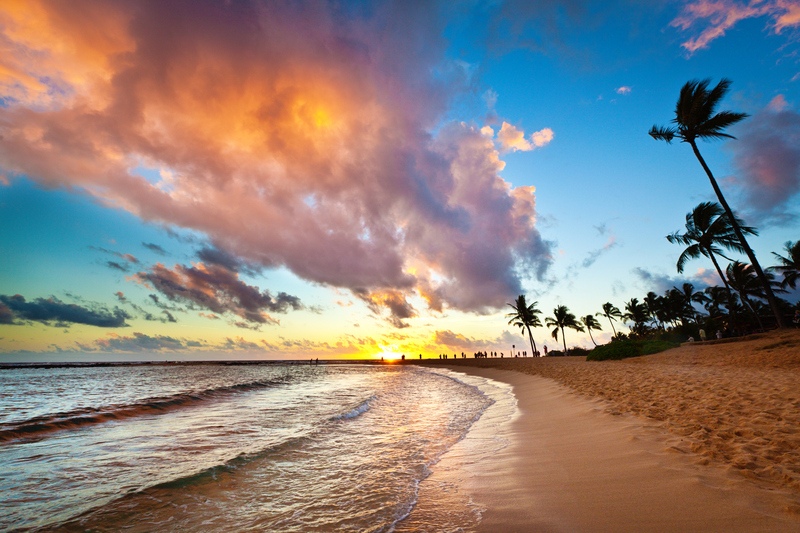 A vacation at our holiday rentals in Kauai wouldn’t be complete without time spent enjoying the sun, surf and sand. When it comes to spectacular beaches, Kauai is known for having some of the most breathtaking ones anywhere in this island chain. Here are a few you may want to explore while you’re here. 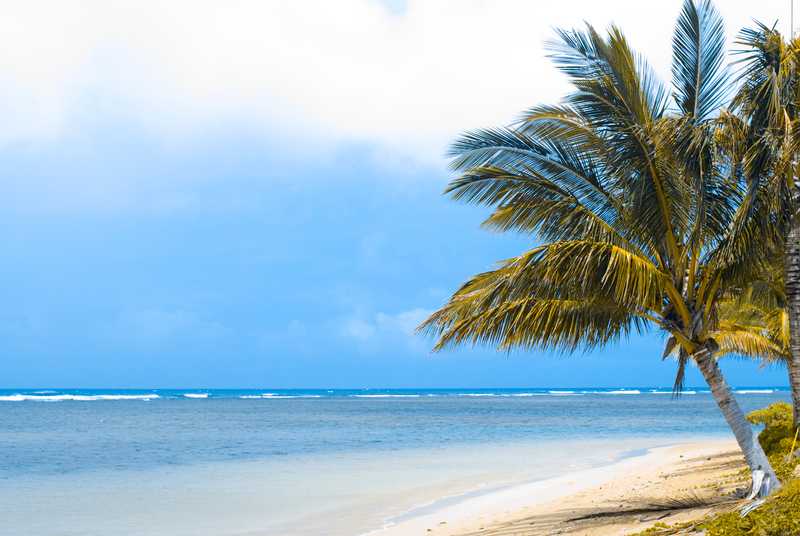 Located on a quiet lagoon, Anini Beach is known for its deep turquoise water, white sands and mature shade trees. This natural spot was created in part by a natural coral reef that circles the island, which you’ll be able to see peeking out from the shore. This beach is ideal for snorkeling, fishing, and canoeing, and offers public restrooms and showers. Perfect for snorkeling, this beach is also surrounded by natural coral reefs and is the last beach along the North Shore that is accessible by automobile. During the summer months, the waves here are relatively calm, but they can become extremely rough during the winter. 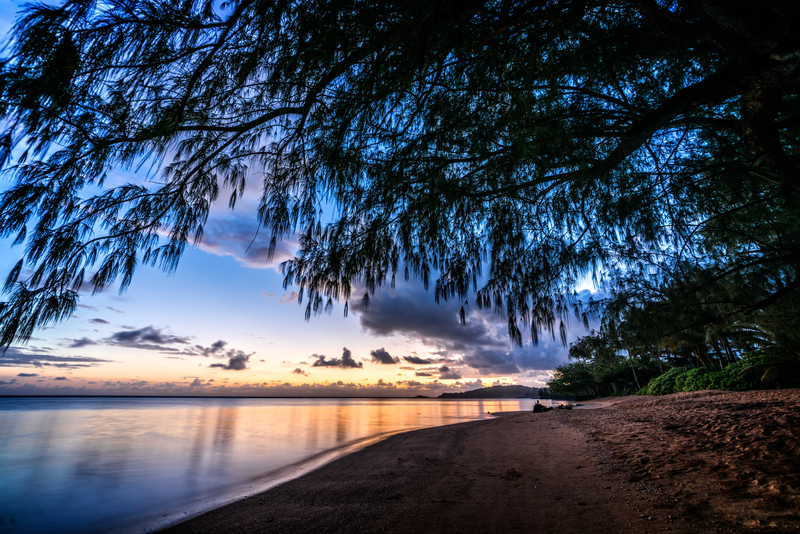 The shoreline provides spectacular views of the Na Pali coast, making it a great spot to catch the sunset. With a wide stretch of sand, mountainous backdrop, Lumahai Beach once served as the site for a scene in the movie South Pacific. Its waves create an ideal spot for bodyboarding or surfing, but guests also visit to enjoy nature watching, photography, and fishing. There are no lifeguards or public facilities, so swimming is not recommended. 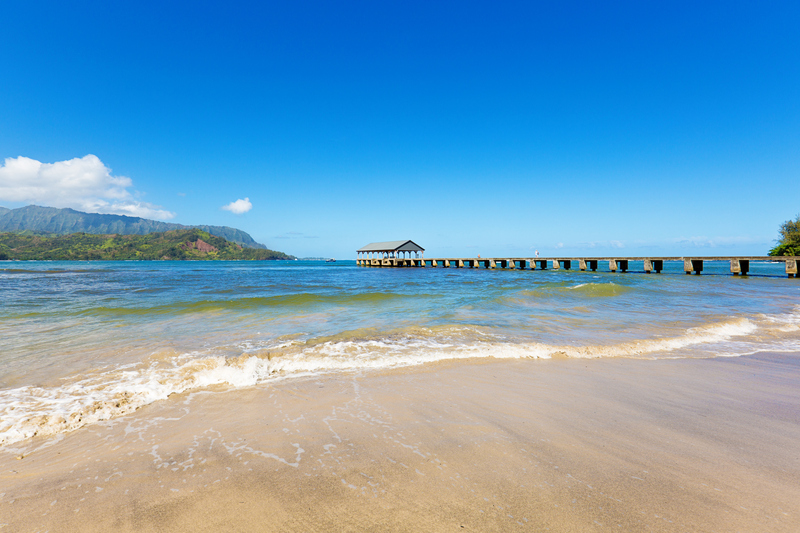 Just outside of Hanalei Town, this half-moon-shaped beach is most famous for the Hanalei Pier, a 340-foot structure listed on the National Register of Historic Places. From the pier, you’ll take in remarkable sunsets or enjoy excellent fishing. 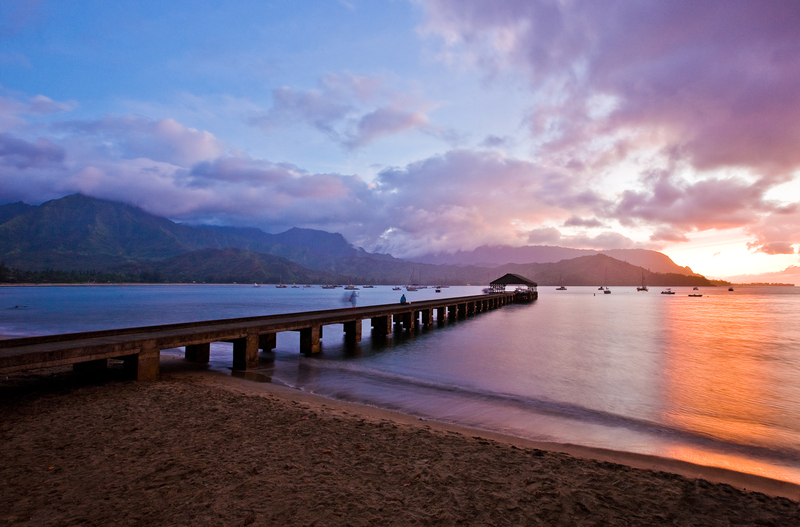 Surfers often flock to Hanalei Bay Beach because of the magnificent waves that can be enjoyed here. Restrooms, lifeguards and a picnic pavilion are also available. 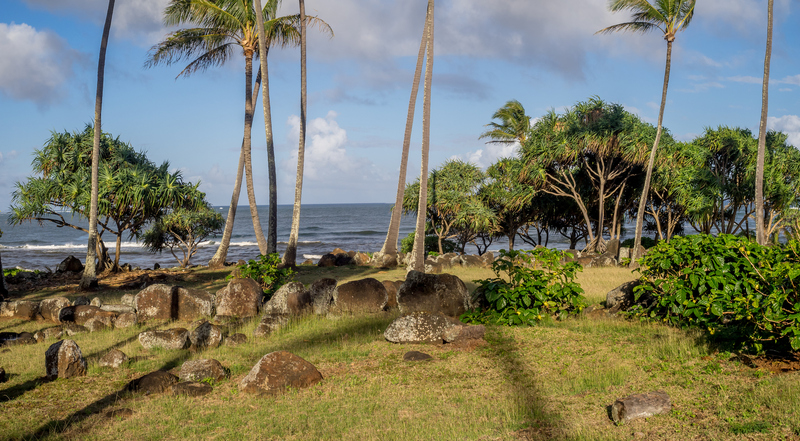 Located on Kauai’s south shore, this beach is known for its population of Hawaiian monk seal, which regularly make appearances along the shoreline. It’s an ideal place for families with small children, as it has restrooms, picnic facilities and a natural wading area that’s close to the beach. Whale watching, kayaking and snorkeling are also popular pastimes here. While this east shore beach is popular with the surfing crowd, it’s also an excellent spot for sailing, swimming, and canoeing. The wide beach provides plenty of room for building sand castles, and beach volleyball is often enjoyed here as well. You’ll find dozens of unique shops and restaurants all just a short walk away, and many of the restaurants also have beachfront dining tables. 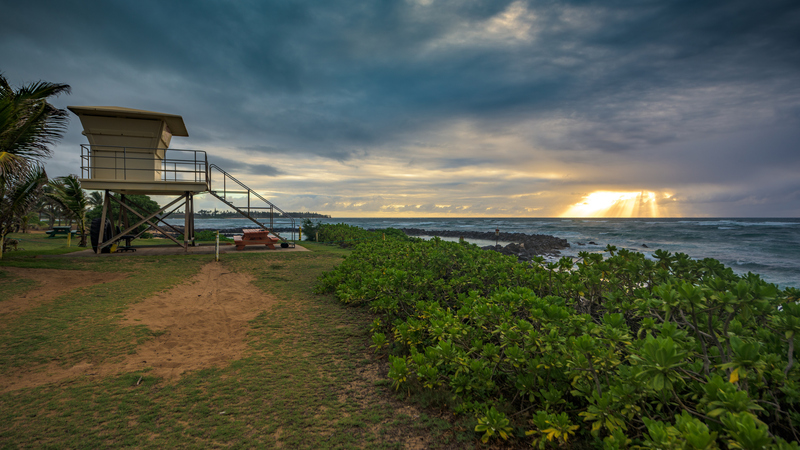 One of the more popular beaches along the eastern shore, Lydgate beach has picnic facilities and restrooms, and lifeguards are on duty during daylight hours. Since the beach is partially protected by a lava wall, the shallow waters of its lagoon are popular with beginning snorkelers. 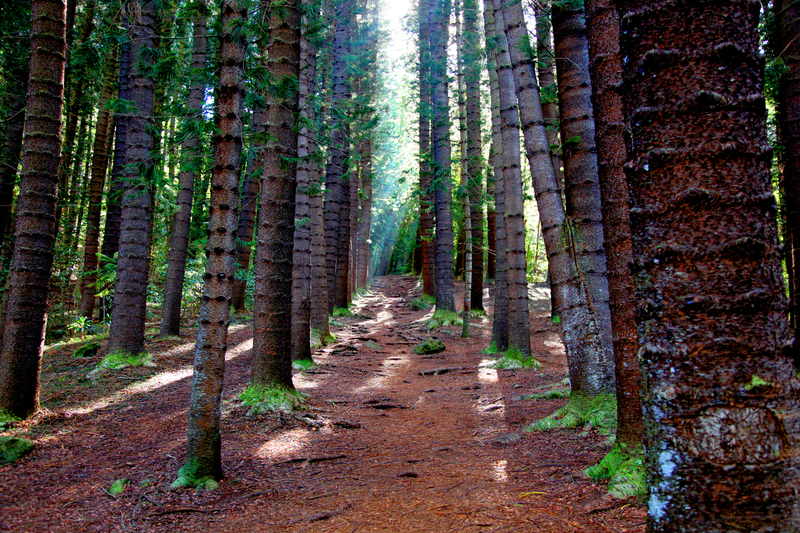 Several hiking trails can also be found here. A popular spot for surfing and boogie boarding as well as walking and jogging, this crescent-shaped beach is exactly a half-mile long and features ample paths. Pets are permitted at this beach, as are bonfires after dark. Plenty of parking is also available along with newly renovated restrooms and picnic facilities. 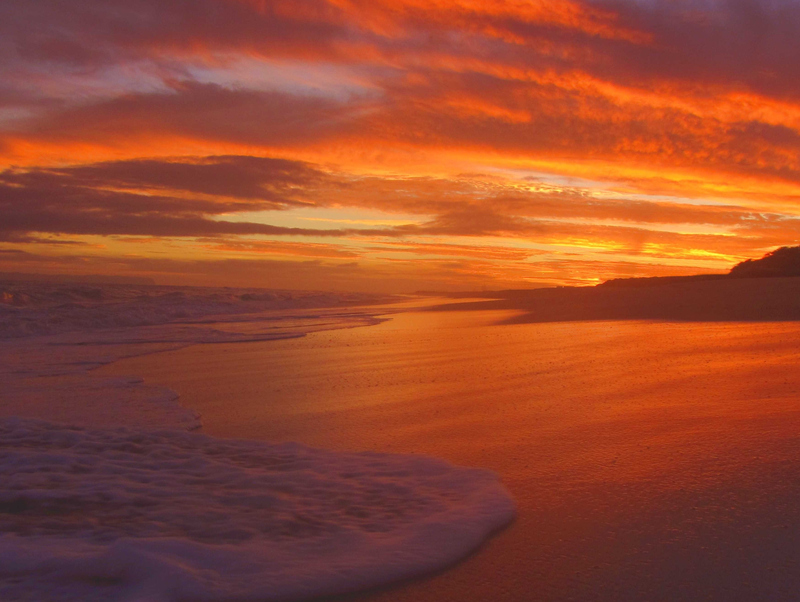 One of the quietest areas on the western shore, Kekaha Beach is characterized by light beige sand and deep green waters that sometimes turn a shade of red. 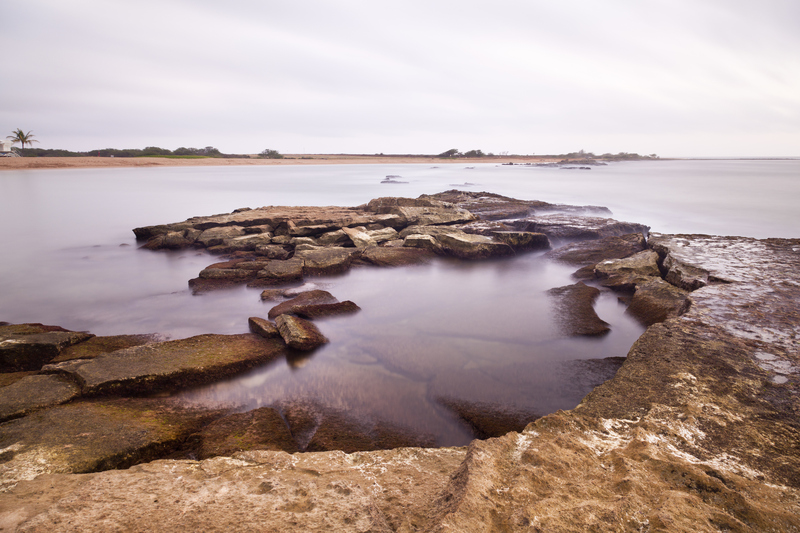 This beach is said to be one of the best fishing spots in the area. It’s also ideal for surfing, canoeing, kayaking or body boarding — but use extreme caution, as no lifeguards are on duty here. Protected by an outside reef, this west shore beach contains relatively shallow and clear waters close to the shoreline, making it an ideal spot for swimming, snorkeling, and fishing year round. You can spot monk seal from time to time at several large rocks near the shore, but use caution, as the rocks can be very slippery. Sailing, canoeing, kayaking, surfing and bodyboarding are all popular activities here as well. Looking for the perfect homebase for exploring the island’s most scenic beaches? Tucked on the east side of the island in Kapaa, Fern Grotto Inn offers authentic old-style plantation cottages with island-inspired furnishings and modern amenities. Discover the Kauai vacation rental you’ve been dreaming of, surrounded by a lush landscape of fruit trees and located only a block from the beach. Please contact us to see how we at Fern Grotto Inn can help make your stay on the Isle of Discovery an unforgettable adventure! At our vacation rentals in Kauai, our guests love paddling along the Wailua River using our two-person complimentary kayak. 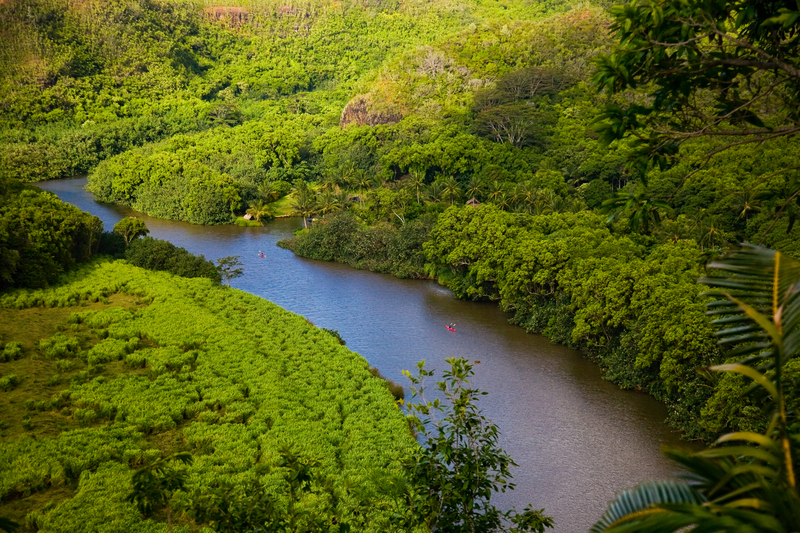 Ten miles long, the Wailua River is Hawaii’s only navigable river and has plenty to offer for guests of all kinds. Read on to discover what you could explore while paddling down the Wailua. This tranquil waterway meanders through a lava canyon and jungle landscapes where the sacred lands were once the setting of heiau (temples) and are the birthplace of Kauai’s ali’i (royalty). For many years the area was restricted only to royalty, but today it’s a popular attraction frequented by many visitors to the island. Tributaries feed the river as it slowly makes its way to the ocean. At the mouth of the river are several large rocks with ancient petroglyph carvings, and near the south end of the river is Wailua Falls. Two cascading streams drop 80 feet to the river below, and rainbows are often visible here in the morning. Also along the river is Opaekaa (“rolling shrimp”) Falls where the water pours into a hidden pool. 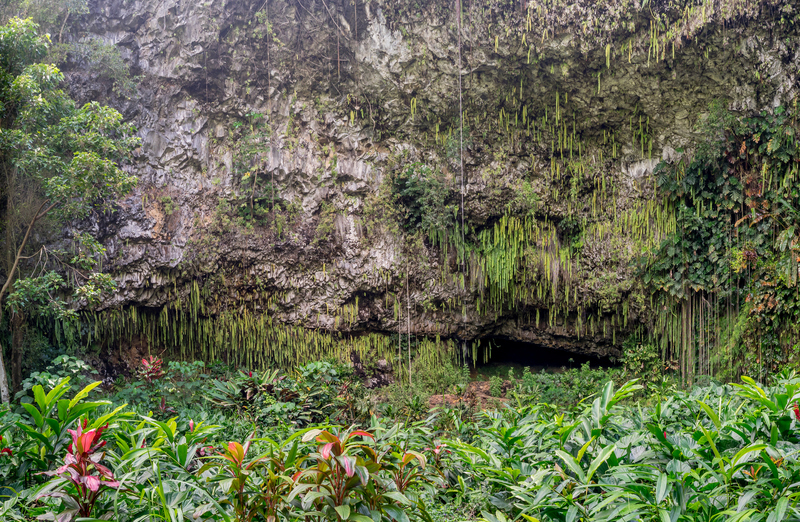 The river ends at the Fern Grotto, a geological wonder where ferns grow upside down from the lava rock roof. Native Hawaiian plants and colorful tropical foliage add to the grotto’s rainforest ambiance. The grotto was nearly destroyed by Hurricane Iniki in 1992, but plant life has somewhat rebounded. A rock slide in 2006 has changed the way visitors view the grotto. It is no longer fully accessible, however, an observation deck allows visitors to enjoy its beauty from a bit of a distance. The Fern Grotto is still considered the most romantic spot on Kauai and numerous weddings are performed there each year. Wailua River is a mecca for watersports enthusiasts. Kayakers have their own “lane” on the right side of the river. Tour boats and water skiers enjoy the river’s calm waters on the left side of the river. 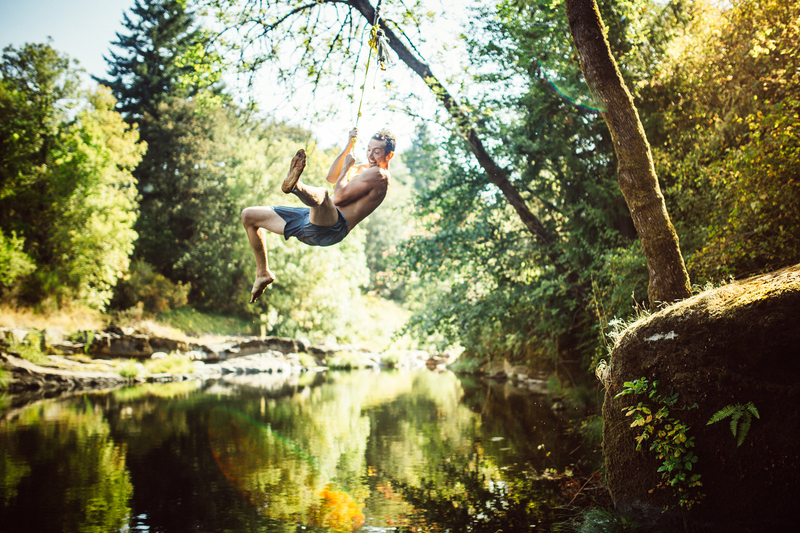 Along the river are interesting spots to visit including a bird sanctuary, a traditional Hawaiian village, Secret Falls, and a pool for rope jumping. After a day of paddling, come home and relax at our inviting Kauai vacation rentals. Tucked on the east side of the island in Kapaa, Fern Grotto Inn offers authentic old-style plantation cottages with island-inspired furnishings and modern amenities. Discover the Kauai vacation rental you’ve been dreaming of, surrounded by a lush landscape of fruit trees and located only a block from the beach. Please contact us to see how we at Fern Grotto Inn can help make your stay on the Isle of Discovery an unforgettable adventure! There’s no better spot to have the perfect island day than from our authentic plantation cottages in Kauai. With modern amenities, a postcard-worthy landscape and a convenient location near sightseeing, outdoor adventure and authentic restaurants, Fern Grotto Inn offers the ideal homebase for getting up close and personal with Kauai. Pack it all into one unforgettable day with this itinerary. Begin the day with breakfast at one of our local restaurants. Plan your adventures as you linger over pork tocino and eggs at Kauai Family Cafe or a Tropical Thunder Skillet at oceanfront Lava Lava Beach Club. Some of the most beautiful spots in Kauai can’t be reached by car, so consider taking a helicopter tour to view the lush tropical landscape, or hop aboard one of the river boat tours that travel down the Wailua River to the Fern Grotto. After your morning adventure, return to your Kauai cottage for lunch. Grab meal fixings at the local market and meander into our garden and pick a fresh mango for your salad. Most of our cottages have fully equipped kitchens for easy preparation. After your meal, take a nap in a hammock or sink into a comfortable chair and catch up on your reading before heading out for swimming and snorkeling. It’s a five-minute walk to the beach. Be sure to grab some of our complimentary beach gear: coolers, chairs, mats, umbrellas, boogie boards, fins and plastic beach toys for the kids. Return to your cottage to rest and freshen up for a late evening dinner at Smith Family Garden Luau, nestled in a 30-acre botanical garden just a 15-minute stroll from our cottages. Enjoy a luau complete with emu oven, dancers, and traditional Hawaiian entertainment for an authentic Kauai evening. For a more relaxing evening, wind down at your cozy cottage by cooking dinner on the BBQ and lounging on the lanai while watching the stars, admiring our garden and listening to the native birds and sound of the sea crashing in the distance. 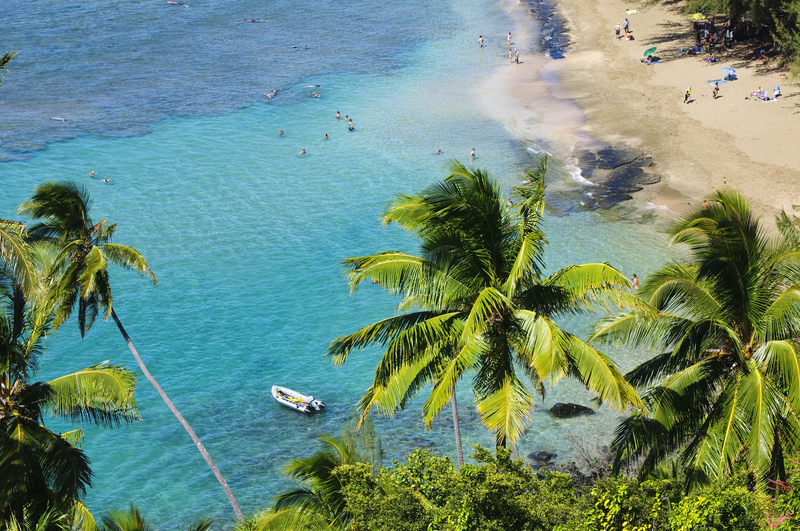 Ready to experience our Kauai? Tucked on the east side of the island in Kapaa, Fern Grotto Inn offers authentic old-style plantation cottages with island-inspired furnishings and modern amenities. Discover the Kauai vacation rental you’ve been dreaming of, surrounded by a lush landscape of fruit trees and located only a block from the beach. Please contact us to see how we at Fern Grotto Inn can help make your stay on the Isle of Discovery an unforgettable adventure! 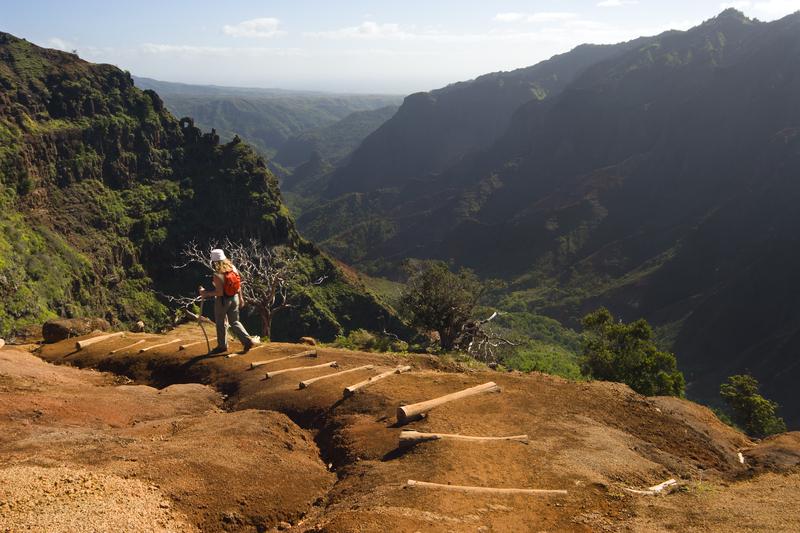 While you’re staying at our vacation rentals in Kauai, there’s no better way to witness the beauty of the island firsthand than by hitting the trail. 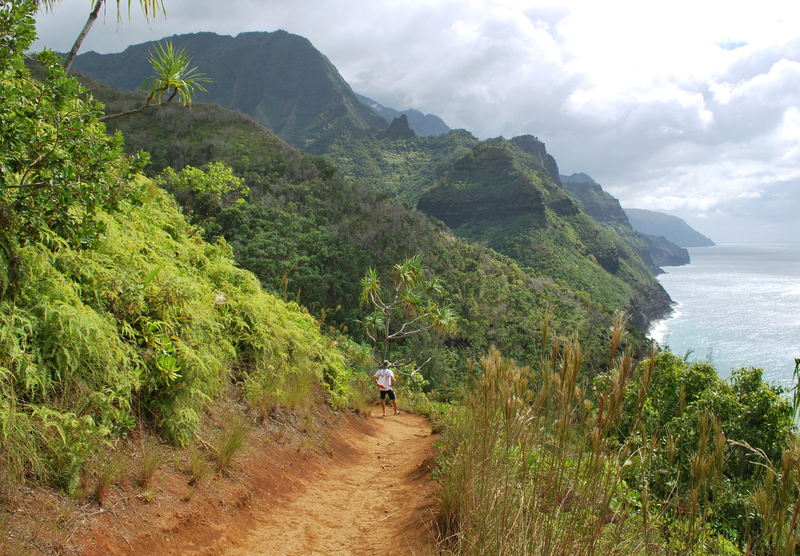 Kauai is known for having some of the most magnificent scenery found anywhere, and these trails travel through the heart of it. The Nounou Mountains are said to resemble a sleeping giant, and this trail passes directly through them, stretching across the area that resembles the giant’s chest. It’s a steady, 1,000-foot climb up the side of the mountain through native forests of ironwood and guava trees. This 3.5-mile long trail provides spectacular views of Kapaa and Wailua Bay and ends at a picnic grove where you can stop for a hard-earned lunch. This dirt trail can be difficult after a hard rain, as portions of it can become extremely muddy. If you feel well-rested after enjoying your picnic lunch, continue on another leg of the trail that will cross the giant’s face. We recommend this stretch for advanced hikers only, as parts of the trail are very narrow with extremely steep drop-offs. 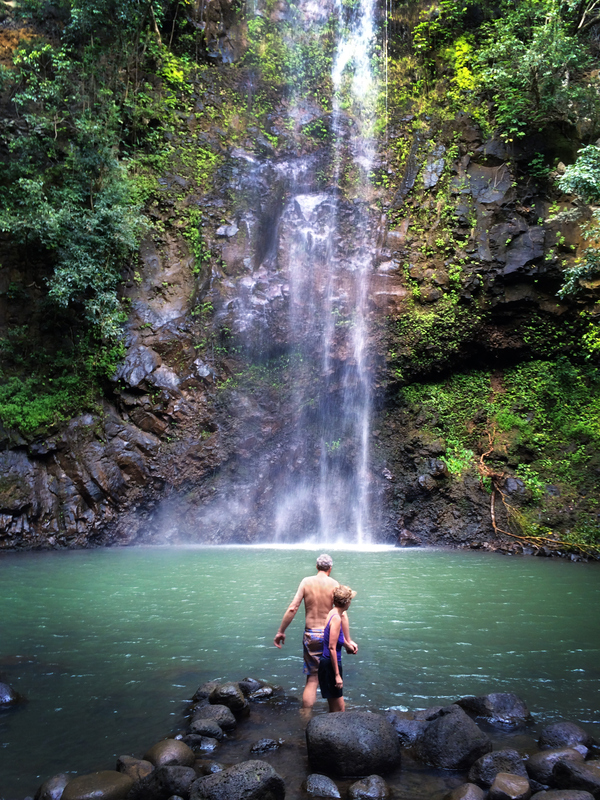 The Makaleha Falls hike is only 3 miles long, but will require a bit of adventure to navigate — dense growth requires bushwhacking in some parts, while others require wading through a stream or rock-hopping. Plan at least a half day to experience this trail, as you’ll want to have time to enjoy the beautiful falls, intriguing forests and breathtaking mountain views. You’ll also have the chance to cool down in a pool at the bottom of the falls. Since parts of this trail are not well-maintained, it’s highly recommended that you bring a compass with you in case you get off course. If you’re still a little unsure about navigating this trail, we can recommend local guides. This trail begins in Ha’ena State Park, and extends through several valleys and along oceanside cliffs. You’ll pass over rushing streams and enjoy views of several magnificent waterfalls along the way, as well as glimpses of the remains of some stone terraces that once were homes for native Hawaiians. This trail concludes with a stretch of flat land along the beach, which can be especially breathtaking to walk along during sunset. This hilly hike offers few level spots throughout, so expect it to take the better part of a day, even if you are in good physical condition. It’s highly recommended that you depart early in the morning and carry plenty of water with you to avoid dehydration. Along the way, you’ll have plenty of chances to cool off in the ocean waters that run alongside this route, and enjoy tropical plants and stunning views of local cliffs. Keep an eye out for interesting wildlife, including herds of wild goats. If you’d like, the Kalalau Trail can also be broken up into sections to make it easier to navigate. Hike the two-mile stretch from Ke’e Beach to Hanakapi’ai falls, and you’ll have a fairly easy hike that provides you with views of spectacular waterfalls. A four-mile section spanning from Hanakapi’ai to Hanakoa features a steep climb of 800 feet and partially passes through the Na Pali Natural Area Reserve. The final stretch is a five-mile trek, which consists of panoramic views of the local valley and narrow sections of trail that hug the cliffs very tightly. After a day on the trails, come home and relax in our Kauai vacation rentals. Tucked on the east side of the island in Kapaa, Fern Grotto Inn offers authentic old-style plantation cottages with island-inspired furnishings and modern amenities. Discover the Kauai vacation rental you’ve been dreaming of, surrounded by a lush landscape of fruit trees and located only a block from the beach. Please contact us to see how we at Fern Grotto Inn can help make your stay on the Isle of Discovery an unforgettable adventure! Grab your snorkeling gear! During your stay at our cottages in Kauai, you’ll have plenty of chances explore the vibrant waters of the Pacific. Over 45% of our shoreline is completely untouched, so you can enjoy the thrill of simply sticking your head under the water and taking in all the tropical fish, coral, and other sea life. Here are some of the best spots on the Garden Isle to discover a world beneath the water. At this ocean lagoon on the north shore, sparkling green-blue sea is filled with fascinating marine life.Not only is Ke’e the most popular beach on the island, but this stretch of rocky coast is said to be the birthplace of the hula dance! Otherwise known as Makua, this sandy strip of paradise is four minutes away and is home to families of turtles and seals. Just offshore, a plethora of captivating undersea rock formations can be viewed easily from the surface. Dive deeper to witness series of twisting, underwater lava tubes. While there are no facilities or lifeguards at Makua, it’s well known for its very calm wave action, so snorkelers of all levels of expertise can explore. A perfect refuge for the inexperienced snorkeler! Man-made ponds have been carved out of the shallow waters, offering a relaxed and controlled swim. You’ll find full amenities here, including showers, lifeguards and parking. This beach, located on the east side of the island, also sports a picnic ground and massive playground for hours of family fun. This idyllic stretch of northern coast is protected from the changing tides of the Pacific Ocean by Hawaii’s largest coral reef. This creates a lake-like experience that’s perfect for laid-back or beginners snorkeling, as well as paddleboarding and sailboating. After you’re tuckered out from your adventures, stroll along the tropical shore or relax at the park, where you’ll find showers, barbecues and picnic benches. Renowned for its monk seals and prime fishing, Salt Pond Beach Park offers a crescent-shaped cove with a plethora of aquatic life. Lined by palm trees, this local favorite is reminiscent of the Hawaiian beaches you’re used to seeing in the movies. This completely protected southern park has received several awards. On winter days when the north shore’s tide is rough, the southern waters off of Po’ipu are usually completely flat, making this park a perfect spot for carefree snorkeling and swimming. For more daring beachgoers, the surf outside of the protected area is very intense and challenging. Check local weather reports to ensure the conditions are suitable for you and your party. While protected areas provide a safe and decently entertaining experience, untouched coves and reefs offer a wide library of tropical fish and brilliantly colored coral. The water tends to be mellow at low tide or in the morning, before the wind starts. Safe Entrance, Safe Exit. Most coastal locations have strips of sandy channel that offer a good place to go in and out of the water.